Ask Dr. Universe: What happens to our trash? Fri., April 13, 2018, 3:57 p.m. If you’re anything like me, maybe one of your weekly chores is helping take out the trash or making sure all your tuna cans get into the right recycle bin. The truth is, I wasn’t entirely sure where the garbage goes either, so I decided to ask my friend Karl Englund. Englund is a research engineer at WSU and studies all kinds of different materials in our world. He is really curious about how we can take materials and give them a new purpose. Our garbage can end up in a few different places, he says. The average human who lives in the U.S. creates about 4.83 pounds of trash each day. As you can imagine, it piles up pretty quick. Many people don’t really see much of it, though. 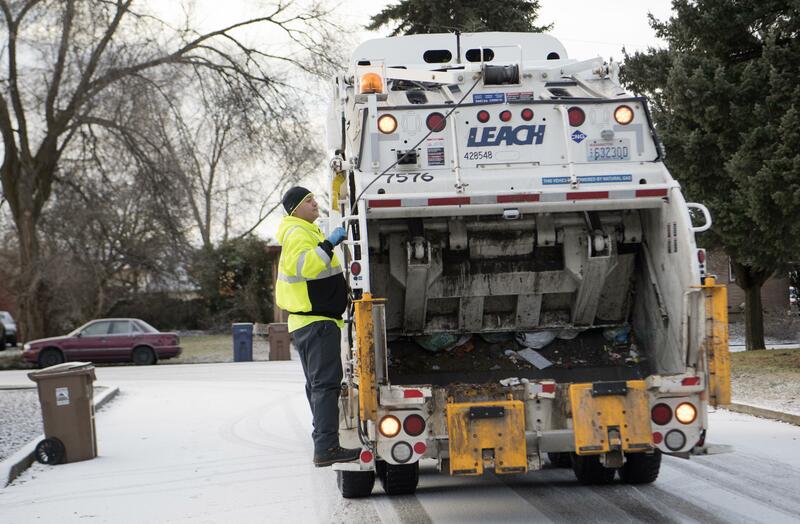 Englund explained that after sanitation workers pick up the trash in their big trucks, they often drive to a landfill. A landfill is a place where we bury garbage underground. Some garbage will break down pretty fast in a landfill. Something like a banana peel will become part of the soil again in about a week or so. Some people even let these organic things break down into something called compost and use it to help their gardens grow. But then there are other items we throw out that don’t break down as easily, such as plastic water bottles. A plastic water bottle can remain in the earth for hundreds of years. A plastic water bottle may not break down in the dirt, but it can be pretty easily made into new plastic materials if we simply recycle it. That’s why it can be helpful to learn about what different materials are made of and how we can dispose of them in a way that helps the environment. You could also repurpose something like a plastic water bottle. If you cut it in half, it might make a nice little container to grow some small plants, Englund says. Or if companies take the bottle and grind it up, they can make things like carpet or even a playground. It takes some science mixed with a lot of creativity. In Englund’s lab, scientists are working with materials from old airplane wings to create a kind of pavement. When it rains, a lot of dirty stormwater often puddles up on roads and flows into the streams and rivers. But pavement made with recycled materials lets water flow straight down into the soil. The soil acts as a natural filter and the pavement keeps toxic things from running off the road into the water. This is really important to the fish and other animals that call the water home. Ask Dr. Universe is a project from Washington State University. Submit a question of your own at http://askDrUniverse.wsu. edu/ask. Published: April 13, 2018, 3:57 p.m.